Dave says I need to stop calling things pizza that don’t have tomato sauce. But he also said this pizza (er…flatbread?) was very tasty, despite the fact that it features a vegetable he isn’t such a big fan of. I may win him over to brussels sprouts yet! And let me just say, lest you think you hate brussels sprouts, that it is truly worth it to give old nemeses a try every now and then. 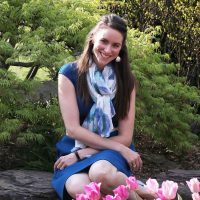 I just read an article about how everyone’s palates change with age, and often foods that were previously despised can become favorites if experienced in the right way. 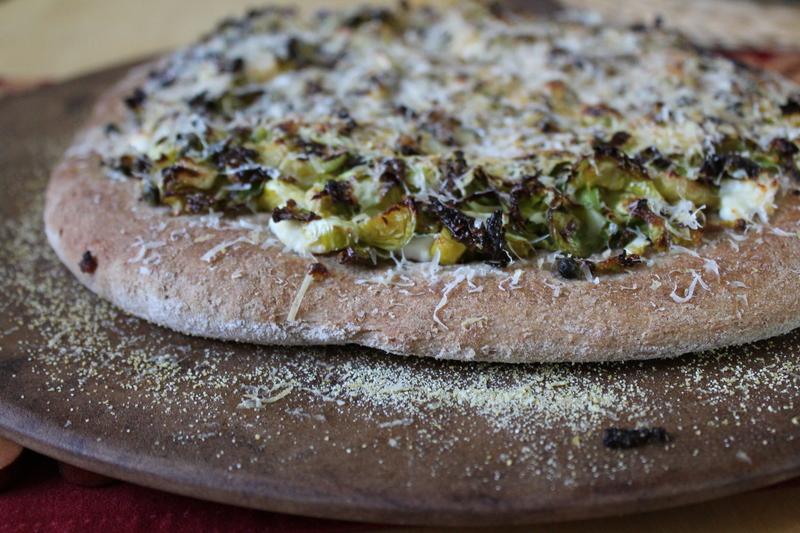 What better way to enjoy delicious brussels sprouts than in the familiar and heartwarming vehicle of pizza? What’s not to like? Goat cheese, garlic, parmesan, fresh rosemary, capers (which I used to push to the side of my plate, but have recently realized I could happily eat by the spoonful…see!? it’s totally true). I probably will make some classic, saucy pizza for my hubby some time soon. But for now, we will both be enjoying this…flatbread. I have always been a little wary of working with chocolate as a candy medium. I am never the one who tops cupcakes with beautiful candy molds or makes chocolate-coated truffles. I mean, I love those things, but I have had serious doubts that a normal person like me could pull them off successfully. I love Pinterest. Who doesn’t? 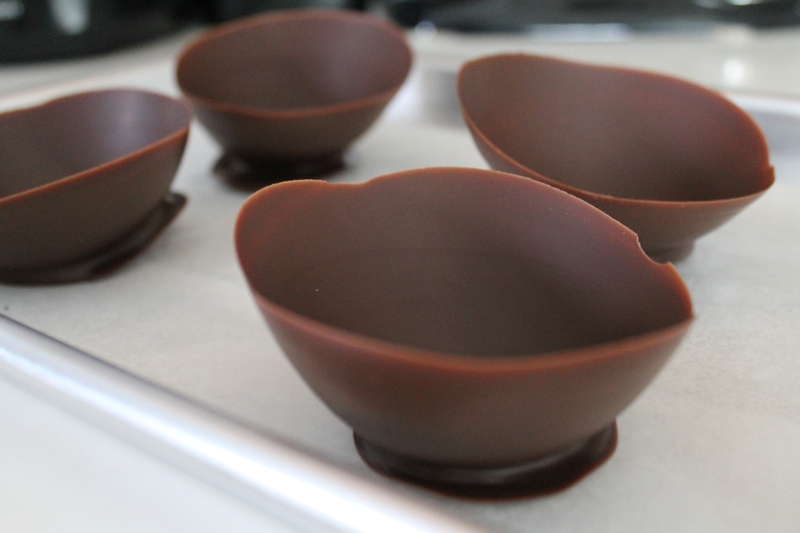 And I found a cute idea for serving ice cream…and I just had to try it for the chocolate mousse I was making. So I gathered my nerves and bought a fancy bag of melting chocolate. 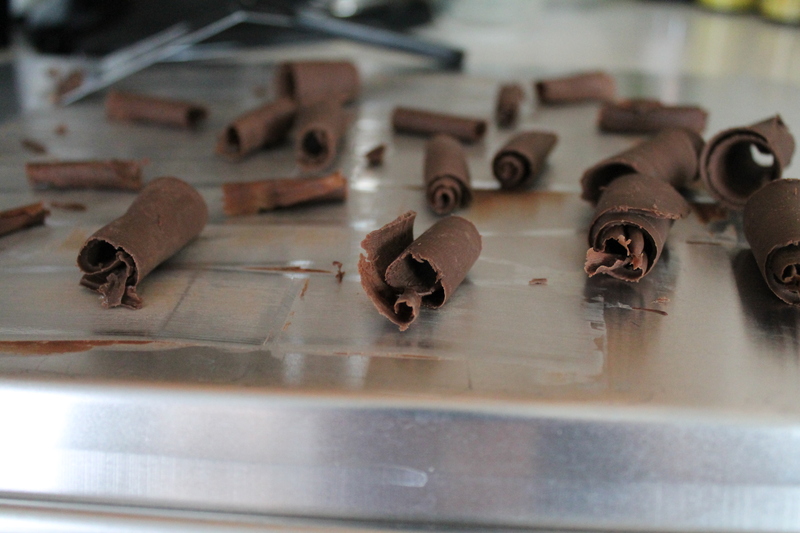 Turns out, making things out of chocolate is easy! And looks super fancy and will impress everyone who sees it! I just had to share this dessert with you (even though I have posted nothing but sweets this whole month—I promise I’m not actually eating this much sugar all the time). Chocolate mousse is my all-time most craved dessert at this time of year. Yes, I know mousse is passé. No, a dessert practically named after two woodland creatures (mouse? moose?) is not particularly romantic. But this chocolate mousse is just so rich and silky, and every spoonful is just deliciously chocolatey, the way it melts in my mouth…I find it luscious. That is all. I suspect the reason I am so ga-ga for chocolate mousse is that I had been all geared up to make it for our Valentine’s dinner two years ago…and then I discovered that Jake was on the way! Mousse = raw eggs = Melissa did not get to eat dessert for Valentine’s that year. I think that experience firmly planted in my subconscious a little timer that goes off around Valentine’s every year demanding chocolate mousse. Absence made the heart grow fonder? Bottom line. Don’t eat this if you are expecting. 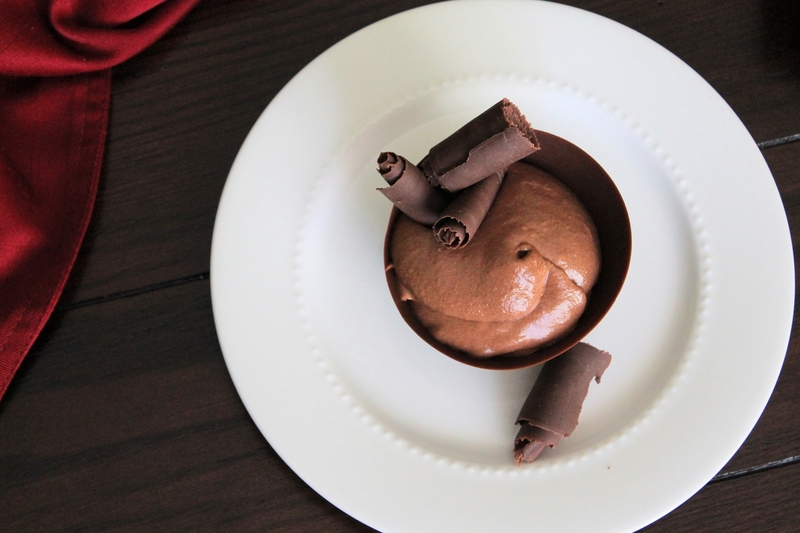 But if you are not…go make this mousse right away! It’s way easier than you think. It seems like everyone I know is sick or trying to get over being sick. Myself included. I have been dripping like a faucet. My head is throbbing like a cartoon thumb that got smashed by a hammer. Not a pretty picture. You know what people keep telling me I need? Apparently, the thing that will help me get better faster (aside from sleep and vitamin C) is tea with honey. News flash. I hate tea. I think it tastes like weak water. And I’ve already admitted I don’t like honey very much (even though I sure have been baking with honey a lot lately…). But I tried it out anyway. And in a brief shining moment of healthiness, I made myself some cookies. Because we all deserve cookies when we’ve been sick, right? These tea cakes really do complement tea well. They are full of honey and lemon zest and healthy whole grains! They make tea bearable! 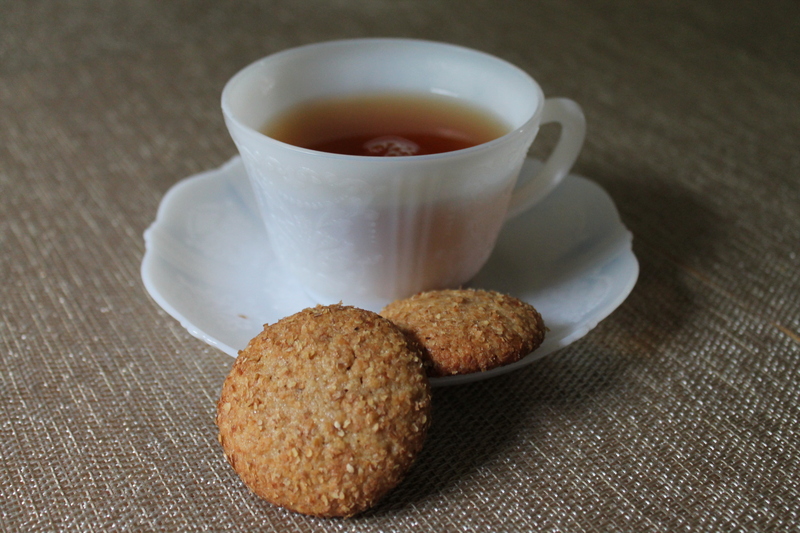 The next time you recommend that some poor, sniveling sickie drink tea with honey to soothe their sore throat, I highly recommend you serve a plate of these cookies to make that suggestion go down smoother. It’s almost Valentine’s day. And if there were ever an occasion that just screamed for a delicious dessert, it’s a day centered around honoring your sweetie, right? 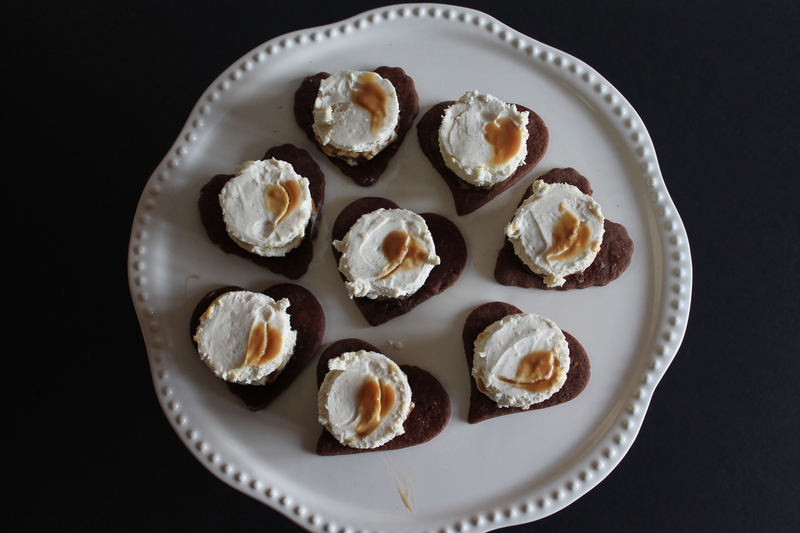 Last week I was telling you about the valentine-themed cooking challenge I participated in. The mystery ingredient was honey, which I have never really liked. Honey is just way too sweet for me…and I really like sweets, so wrap your mind around that one. But I am super competitive, so I dug my heels in and determined to make the best gosh-darn honey dessert ever. As I sat on my couch, examining my copy of the Flavor Bible, trying to figure out what kind of dessert I could possibly make that featured honey prominently but was well balanced, I suddenly realized that cheesecake would do the trick! Cheesecake is naturally tart, and the salt in cream cheese seemed like the ideal complement to the flowery saccharine flavor of honey. These cheesecakes have several components (hey, it was a competition! ), but in the end each piece is quite easy to carry out. They were so delicious, highlighting honey but also bringing in other strong flavors so the honey wouldn’t overwhelm. And guess what? I won the award for creativity! My husband loves whole grain breakfast foods, but doesn’t really like whole grain bread. Me? I would probably trend the other way, given how much I love flaky pastries and cinnamon buns. But this month, as I was perusing Amy’s Cooking Adventures for the Secret Recipe Club swap, I was captured by a recipe for multigrain pancakes. Honestly, one of the things that drew me in (aside from the undeniable delicious and nutritious benefits of eating a variety of grains) was that this recipe is sugar free! That’s right, in place of sugar, these pancakes use honey. 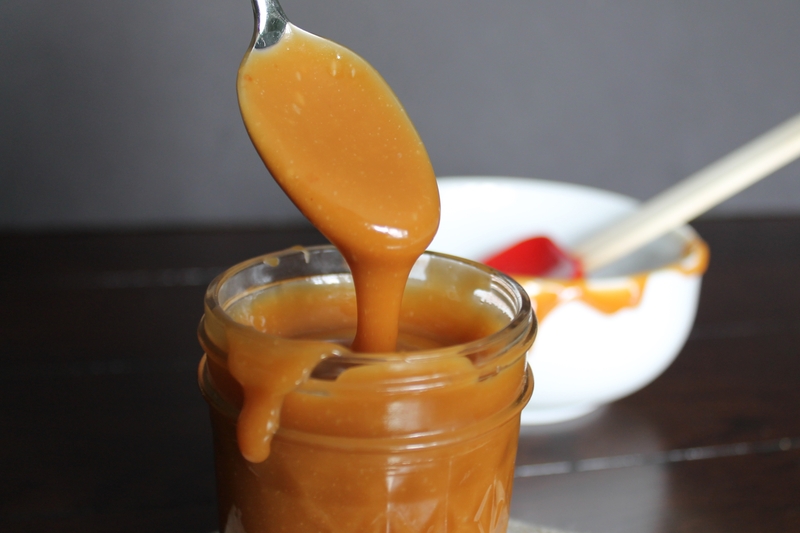 Honey is the perfect complement to the nuttiness of wheat and other whole grains. 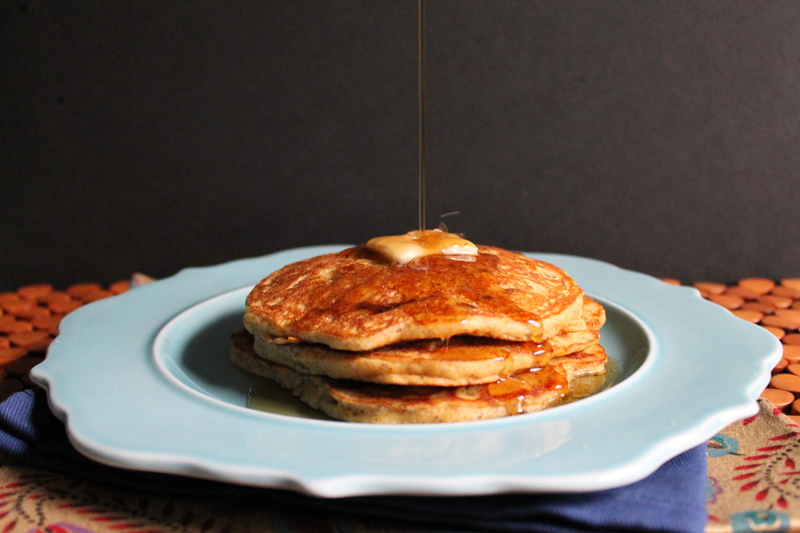 These pancakes are delicious and hearty! I was full after one. (But, um, I still ate two.) You should make them right away! Take them for a swim in a moat of hot maple syrup! Your taste buds will thank you. I have no idea how to start writing this post. I’ve put it off for two days. Do I remind you that I gave up sugar for the month of January? Do we talk about that soufflé I had in a fancy French restaurant at Valentine’s Day two years ago, the one that tasted like chocolate and lemons? Should I tell you about the mystery ingredient cooking challenge I have been doing with some friends? Well. More of all that to come. 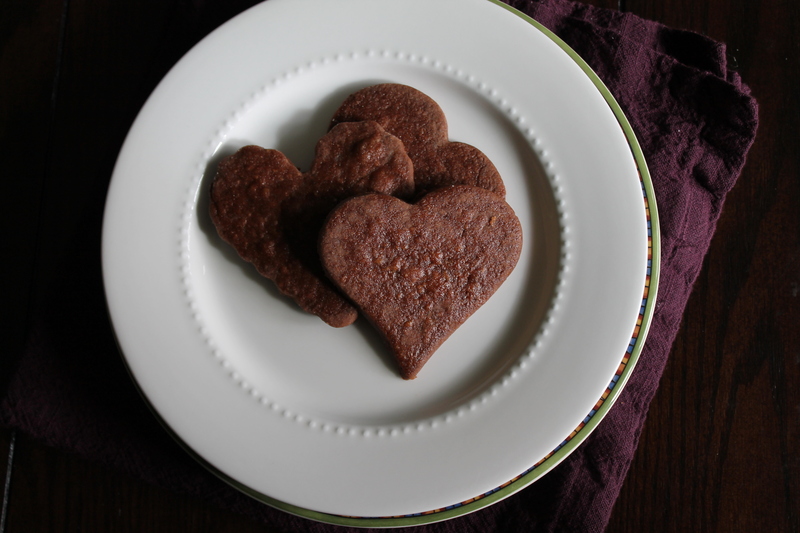 For now, let’s just make some cookies that remind us February can be more than a bleak, gray, icy month. Because even if you aren’t in love, you have to admit that hearts are cute. And we miss celebrating things now that the hectic frenzy of December is long past. Let’s throw ourselves into chocolate and honey, honey!